In 2007, USAID invested in a hydroponic greenhouse facility that enabled 20 Timorese farmers to grow high-value vegetables such as peppers, tomatoes, and eggplant. These new products for local supermarkets replaced vegetables that previously had to be imported, jumpstarting production in Timor-Leste’s Aileu District and increasing cash income for its farmers. Since then, DAC and its predecessor, the Dezenvolve Setor Privadu project (2006–2010), engaged more than 450 farmers in greenhouse and outdoor vegetable production and helped build a stronger fresh produce value chain. Our approach provided technical and management assistance to input suppliers, farmers, traders, wholesalers, retailers, and even lenders, and was designed to ensure that these successes will sustain. 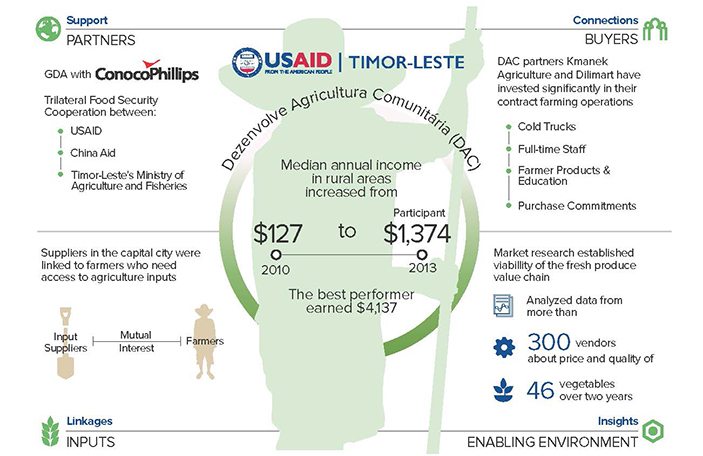 This approach was driven by the market demand for higher quality, more diverse fresh produce and helped establish local horticulture as a contributor to the non-oil economy of Timor-Leste. Farmer groups also contributed to community life, including the refurbishing of a traditional spiritual house and building of a Catholic chapel. One invested cash and labor to repair roads needed for a buyer’s truck to reach their field; others built water tanks for irrigation and planted more than 10,000 trees on erosion-prone areas. Help farmer organize, manage shared production facilities, and negotiate terms and conditions with buyers. Conduct fresh vegetable value chain analysis to identify opportunities and constraints. Examine outdoor market system and collect and analyze data about price and quantity. Facilitate linkage between farmers and the National Commercial Bank of Timor-Leste. Collaborate with supermarkets to build a production-management database. Support buyers to develop and implement vegetable grading standards. Facilitated the formation of three regional farmer group federations. Increased median annual farmer income by 53 percent from $900 in 2012 to $1,374 in 2013. Developed “Farming as a Business” guide that helps farmers transition from subsistence to commercial farming. DAC farmers earned more than $550,000 and improved local housing, school participation, and nutrition. Launched Horticulture Working Group with the Minister of Agriculture in July 2013; the group has since agreed upon goals and continues to seek business synergies.